If you hear “best breakfasts in Mooloolaba”, chances are your mind will flick straight to The Esplanade. 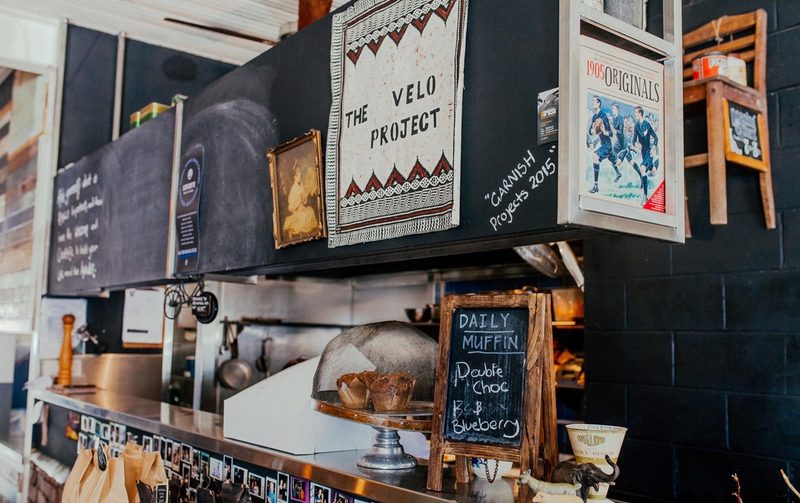 But before you jump in the car or on your cruiser, and beeline for the oceanfront drag, let us get you up to speed on a little neighbourhood gem called The Velo Project. Locals may have a go at us for sharing this neighbourhood gem, but we live by the “sharing is caring” motto, so regulars, if you’re reading, please don’t hate us. 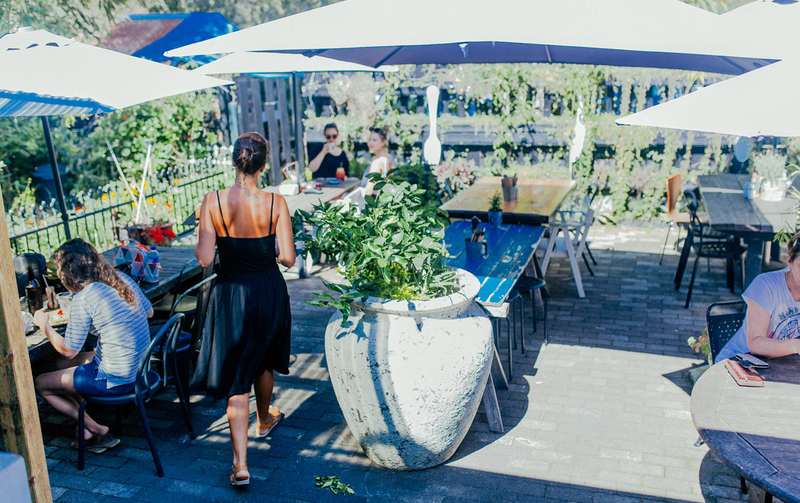 Tucked in the residential area of Mooloolaba, you won’t come by this café unless you hunt it down, which we highly recommend doing. Set in a converted garage and decked out with retro furniture (hello, comfy couches) and knick knacks, this home-style eatery is as far away from bland and sterile as you can get. 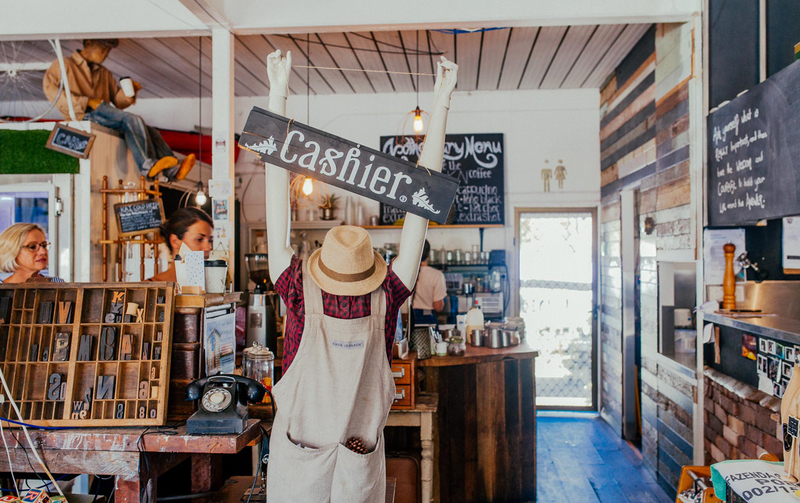 We check it out on a Friday morning, and before we even lay our eyes on the mismatched tables and chairs that sit on the sidewalk and are packed with latte guzzlers, we hear the shrill ring of the café’s antique phone. A takeaway coffee order, no doubt. The service is swift and super friendly, and as soon as we’re sitting, we’re presented with menus (glued onto the pages within old encyclopaedias, no less), lemon water, and our coffee orders taken. 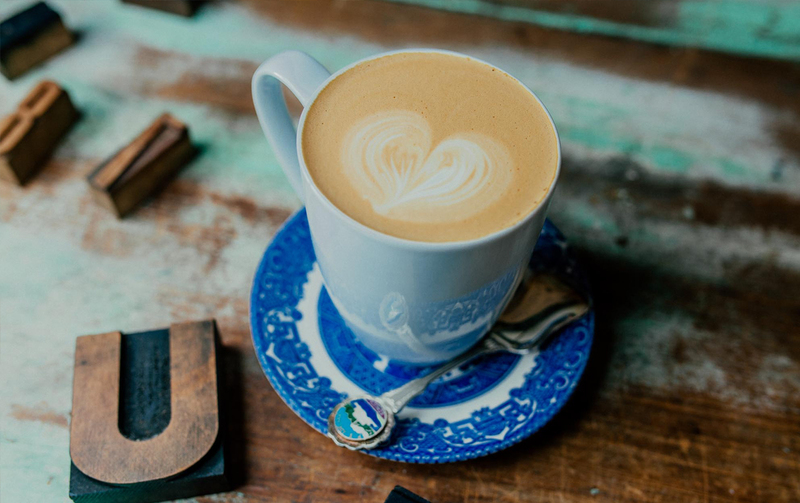 Poured and served within minutes, we get the feeling that these guys know what it’s like to have a serious caffeine habit that needs to be looked after. Quickly! Sipping on smooth, strong coffees, we’re already becoming fast fans. If you can rip your eyes away from the shelves adorned with vintage world globes, worn board games and teapots sprouting greenery, you’ll be rewarded with a peek at the menu and a whiff of what’s to come. Cue: rumbling stomach, ready for food. Midday muse is the smashing lunch menu, and with options like a grilled chicken burger with hazelnut spiced dukkah and avocado, or a grilled Mooloolaba prawn salad dressed with a sweet chilli vinaigrette, you can’t really make a bad decision. But, we’re here for the breakfast. Because these guys rule the AM feast, and that’s all we need to be told to be roped in to downing the most important meal of the day at this Mooloolaba cafe. With a huge emphasis on supporting local, the dishes are primarily from produce and ingredients sourced from around the region. We know we really need to step outside of the box, but when benny shows up on a meu, nothing can take us away from ordering this tried and true favourite. At The Velo Project, we opt to take it with salmon, and it is golden! 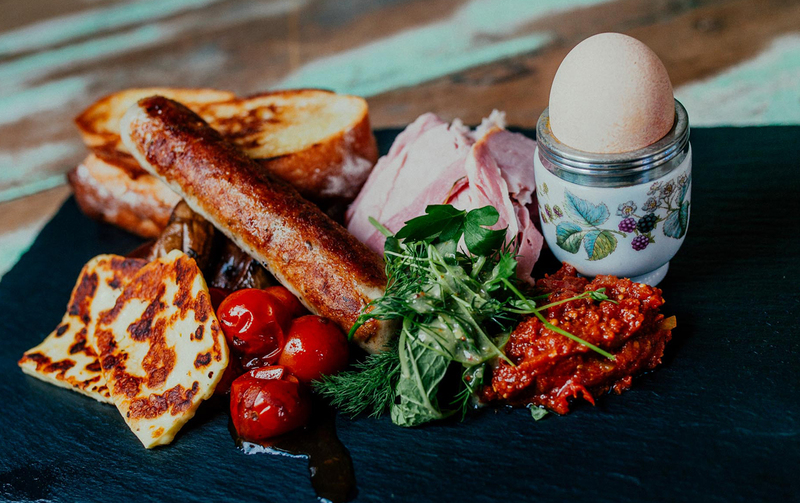 We also go for the Hunters Breakfast because our eyes are naturally bigger than our stomachs, and when someone says you can have eggs, ham off the bone, sausage, roasted garlic mushrooms, haloumi, confit tomatoes, chutney, and ciabatta all on the one slab of slate, well we’d be crazy if we said no. Agreed? Good! There so much more on offer here than egg feature plates, and word on the brekkie vine is that the house-made banana, macadamia and date bread, and the blackberry chia pudding are worthy competition. 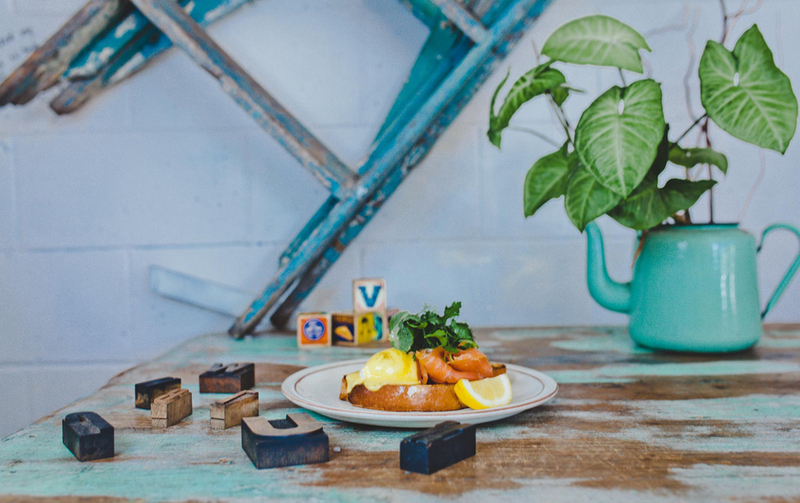 If you’ve got an out-of-town guest staying at your place, or you’re visiting the coast, The Velo Project has our vote as one of the best cafes in Mooloolaba. Head here, for a long, lazy weekend brekkie (there’s plenty of big tables to for your squad to gather around) or if weekday outings are the way you break up the work day, this place is equipped with wifi so you can still remain connected away from the office (and no-one will know the difference). Booyah! Competition closes Tuesday AEST 29/3/2016 and the winner will be notified by email on 30/3/2016. The prize includes breakfast for two people, to the value of $60. By entering this competition, participants agree to be contacted by Metropolist Sunshine Coast.